George and Ira Gershwin wrote the famous “I Got Rhythm, I Got Music” in 1930. 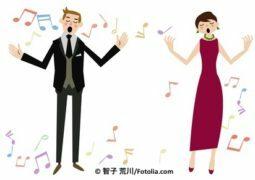 Little did they know that, over 80 years later, a neuroscientist named Nina Kraus and her colleagues at the Auditory Neuroscience lab (Brainvolts) at Northwestern University would show a connection between rhythm, music — and reading. Before we get to the reading part, let’s digress for a few moments and talk about synchronization and rhythm. Most of us are able to keep time to a beat. 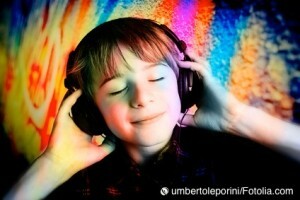 We dance to music, we clap to a beat, we tap our fingers to a catchy tune – even if we’re hearing it in our mind. Synchronizing to a beat is about timing – matching your beat at the exact point in time to the sound of someone else’s beat or to a musical beat. One must precisely match a sound (auditory) with a movement (motor). This entry was posted in Benefits of studying music and tagged Adam Tierney, beat deafness, Kali Woodruff Carr, language skills, Nina Kraus, rhythm, speech processing, synchronization, timing on February 25, 2019 by Lois Svard. Are musicians better at identifying emotional cues in others? About ten years ago, I was startled by a headline that, in essence, said if you wanted a spouse or friend who picked up your most subtle emotional cues, find a musician. Intrigued, I tracked down the research behind the article and discovered the work of Dr. Nina Kraus, Director of the Auditory Neuroscience Lab (Brainvolts) at Northwestern University. This entry was posted in Benefits of studying music and tagged auditory brainstem, auditory processing, Dr. Dana Strait, Dr. Nina Kraus, emotion in speech on February 3, 2019 by Lois Svard. Our lives are filled with sound. On average, Americans listen to music for more than 32 hours a week (Nielsen 2017 study). We spend hours in conversation with co-workers, friends and families. We hear the everyday sounds of traffic, appliances in our homes, television, athletic events, pets, and a great deal more. We never think about what our brains do with all of that – sometimes competing – auditory information. This entry was posted in Benefits of studying music, Hearing and tagged auditory processing, Dr. Nina Kraus, hearing, listening skills, music and speech, neuroplasticity, speech processing on January 23, 2019 by Lois Svard. A few weeks ago, my husband and I visited Lascaux Cave, a well-known Paleolithic cave in southwestern France. Many of you have seen illustrations like the one below – one of about 600 cave paintings at Lascaux with another 1400 or so engravings dating to somewhere between 17,000 and 15,000 BCE. Actually one cannot enter the real Lascaux Cave, which was designated as a Unesco World Heritage Site in 1979. Discovered in 1940, it was opened to the public in 1948, but the 1200 visitors/day produced carbon dioxide, heat, humidity and contaminants that began to visibly damage the paintings. So it was closed to the public in 1963. The only people now allowed in the original cave are technicians/scientists who monitor the preservation of the site. 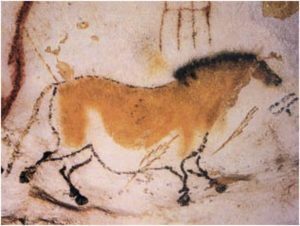 This entry was posted in Origins of music and tagged cave acoustics, cave paintings, echolocation and caves, Iegor Reznikoff, Lascaux Cave, music and caves, Rupert Till on June 28, 2018 by Lois Svard. When musicians or music lovers talk about early music, we’re usually talking about Renaissance music, so roughly between 1400 – 1650, if you extend into the early Baroque. So for us, early music goes back a few hundred years. If you speak to an archaeologist, however, early music takes on a totally different meaning, extending back tens of thousands of years. Archaeologists have found evidence of cultural and artistic innovations including cave paintings, small human and animal figures, and bone and ivory flutes dating to about 40,000 years ago during the Upper Paleolithic era, about the time that early humans first arrived in Europe. 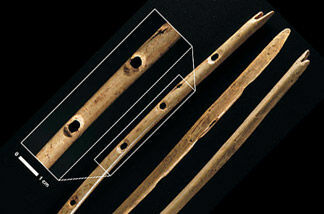 As difficult as it may be to imagine, stone age humans were playing the flute! This entry was posted in Origins of music and tagged Geißenklösterle, Hohle Fels Cave, ivory flutes, Lion Man, Nicholas Conard, prehistoric bone flute, Wulf Hein on June 20, 2018 by Lois Svard. On a cold Friday morning in January 2007, a young man in jeans, T-shirt and baseball cap entered the Washington Metro at the L-Enfant Plaza station during the middle of rush hour, opened a violin case, took out his violin, and began to play – nothing unusual about that scenario since musicians frequent Metro stops on many mornings. For the next 43 minutes, this violinist played 6 pieces, including works by Bach, Schubert, and Massenet. This entry was posted in Cognitive bias in music and tagged art and cognitive bias, branding, executive function, framing, Joshua Bell, musical context, soft drinks and cognitive bias, wine and cognitive bias on April 29, 2018 by Lois Svard.